I wake up at 8:00, then decide that was a mistake and wake up at again at 8:30. Once I’m up, I get some breakfast and collect my things: sketchbook, laptop, pencil case and books. Then it’s time to head out to University. I live on Whitchurch road which is very close to Llandaff Campus. It’s just a half hour walk and I’m there. The walk goes by a main road, but you can cut off into an estate on the way which makes it quiet and rather pleasant. Usually, I go with my housemate Reece and we chat about our projects on the way down. He’s making abstract board games for his MA Design Futures course and I’m making an interactive novel based on The Iliad (It’s cooler than it sounds). We have some pretty interesting conversations. 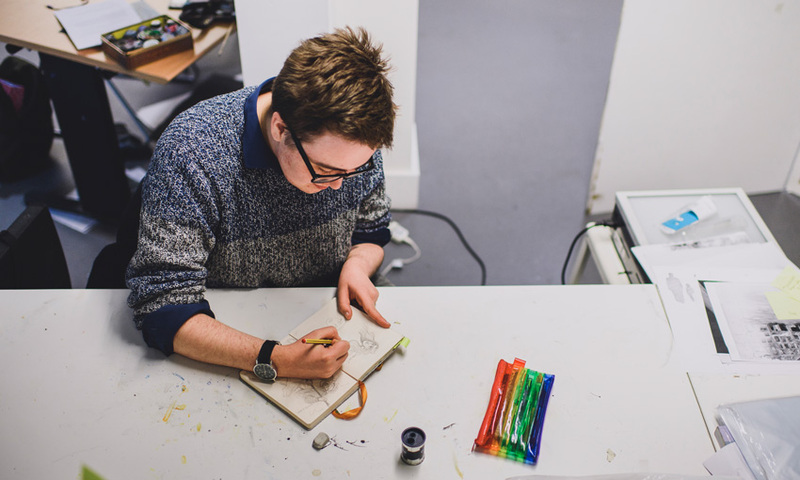 Once I’m at uni, I usually pop up to Starbucks or The Box for a coffee to start the day with, then go to the Illustration studio in N block. I have a desk in the Illustration space that I love. It’s private, away from the main studio and separated with a screen, but near a set of windows and I’m next to some fantastic illustrators. 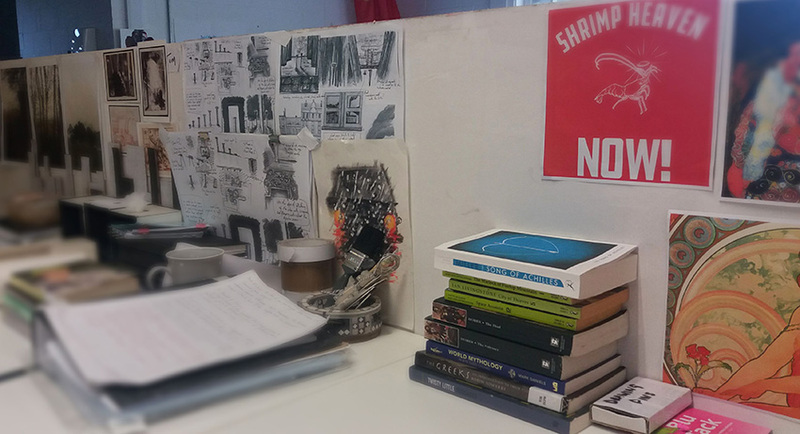 My desk is covered in posters and print-outs of things I like, inspirations and drawings. Books fill up one corner – I sometimes swap books with my neighbours and we discuss what we’ve been reading. It’s so incredibly nerdy and so artsy; in short everything you want an Art University to be. My desk – it’s not always this neat though! Speaking of lunch: At 1, I go to The Box and buy a sandwich to eat at my desk while I take a break, and then it’s back to work. If it’s a Friday, I might have a crit meeting with my fellow Masters students where we see what we’ve all done in the week – this is always interesting, to say the least! After a couple more hours drawing away, I’m ready to go home. Depending on the day this could be anywhere between 3 and 5pm, although in crunch time I’ve been known to stay until 9pm. I usually get the M1 bus home and spend an evening hanging with my roommate and doing some idle work, before going to bed to do it all the next morning. I love the easy and casual atmosphere at Cardiff Met and I’m genuinely excited to get up and work in the studio each day. Find out more about what Cardiff met students get up to – read our other Day in the Life blog posts.